Earthquakes are design problems, and while more and more architects have been offering their support to rebuilding efforts in Haiti and Chile (see roundups of some of them here and here), Core77 opened it up last week as one of its famous 1-Hour Design Challenges. Well, the results are in, and they’re awesome. 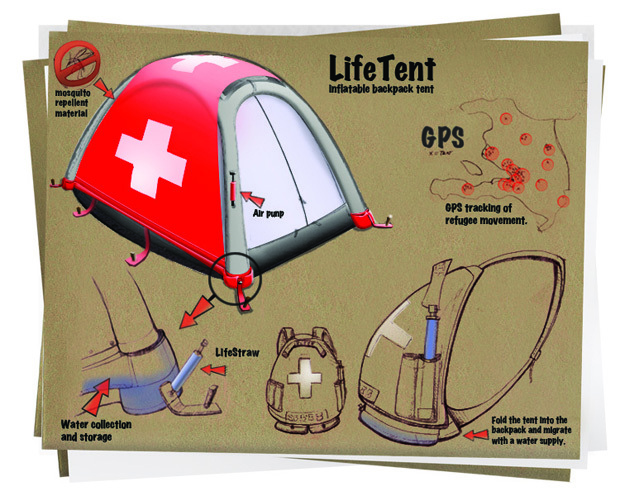 Dan Ostrowski’s winning LifeTent (top) is a backpack-based, pop-up shelter, complete with GPS tracking and an ingenious rainwater-gathering system. Thomas Valcke’s Devil in the Box and Julian Grobe’s Bellow Refuge are two takes on an expanding, accordion-like shelter that would be easy to set up and easier to transport. Michael Kilbane’s Pop-Out Shelter puts the folded-paper trend to good use. See more great work, and more images, here. It’s a perfect take-down of David Sanderson’s outrageous claim, from his editorial in the Guardian on Wednesday, that architects don’t belong in disaster zones because they focus on a “product” instead of “the process (involving people).” He deals in the oldest of architect stereotypes, that of a self-centered, out-of-touch artiste, who cares more about the building itself than the people in it. For architects, ownership of the design rests with them and fellow professionals; for the aid world, engaging beneficiaries through sharing decisions is paramount. Thanks to Core77–and all the other designers offering their help–for proving this prejudice wrong again.